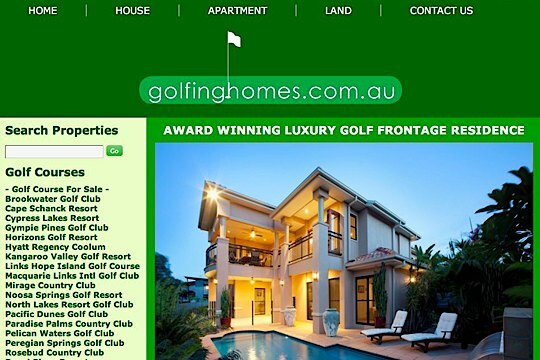 Finding that dream golf home has become even easier with the launch of new property website www.golfinghomes.com.au. The boutique website acts as a master directory for people wishing to purchase properties with golf course frontage or associated with golf courses and was borne out of frustration. Its founder, Patsi Brown, lives in the residential golfing community of Horizons Golf Resort at Salamander Bay. The Community Association of Horizons until recently restricted the display a “For Sale” signs on properties. Also, there was the added problem of the properties being in a gated estate, a foreign notion for the local real estate agents. “We have been operating since mid-July and already for October achieved over 21,000 hits and 25,000 in November from Australia and overseas,” Brown said. Brown said the site is very user-friendly and provides search facilities for properties by state, type, golf course or region leading the user directly to your property website listing. “Imagine the hassle of trying to find a waterfront home in any of our major cities – an exhaustive search of many agents in many suburbs is the only way to do it. And until now, that was the only way to find golf course properties,” Brown said. “We do not share in commissions or have any contact with individual clients. The listing fee for properties is $100 until sold. So Brown decided to set up a small website with the express purpose of helping residents within Horizons to market their properties. As the idea grew, so did the amount of visits to the site over a very short period. She said the problems associated with finding unique properties came in a variety of ways. “Either the golf course properties are listed with a number of local real estate agents or they are marketed by a developer or a combination of the two,” Brown said..
“Unless the prospective purchaser has specific knowledge of the golf course or the geographical area and real estate agents, finding these unique properties is, to say the least, difficult. With the growing number of overseas visits to the site, this factor is of real importance. The ‘one stop shop’ approach is the obvious way to simplify the search for non-locals, ex-pats and overseas investors alike in finding these desirable and unique properties. Patsi and her husband George are both keen golfers. George, a retired commercial television executive, has been able to greatly assist in the initial stages of marketing the concept in a broader spectrum. “Although very time consuming, personally meeting with the marketing personnel of the individual golf courses, developers and real estate agents, is the most productive way to create awareness of the site,” said George. Even though it’s early days, golfinghomes.com.au is currently carrying more than 200 properties all of which either have golf course frontage or are within golfing communities.